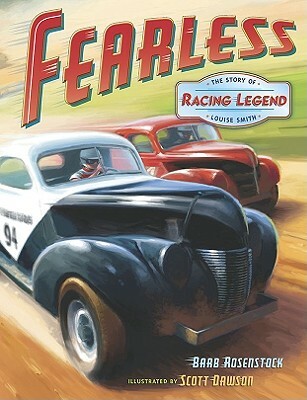 Fearless: The Story of Racing Legend Louise Smith by Barb Rosenstock, illustrated by Scott Dawson. Grades 2-5. Dutton Children's Books, 2010. Reviewed from library copy. In those days it was pretty tough to be a girl. You had to follow the rules. You couldn't speak your mind. You had to ask permission... Louise was a girl of those times, but she didn't play by the rules. Most of the time, she did exactly as she pleased. Louise liked to do her own thing. And she liked to do it FAST! When she was only seven years old, she took the wheel of her father's car... and crashed it into the chicken coop! It was the first time she drove, but it wouldn't be the last. Louise grew up to be a race car driver, racing for 11 years and winning 38 races. She was the first woman elected to the International Motorsports Hall of Fame! Y'all know I love picture book biographies and this is a great one to check out. From the illustration on the second page depicting Louise driving her father's truck, a grin on her face and a maniacal glint in her eye, I knew that Louise's story was not to be missed! Scott Dawson's paintings work well with the text in showing the life of a strong woman who wasn't afraid to go for what she wanted. Louise was born in 1916 and she was racing at a time when that's not what nice girls did. This is a great title for your Women's History units. Not only is Louise Smith a name your students probably don't already know, but the racing subject matter may increase appeal for the boys. Back matter is included that fleshes out Louise Smith's story a bit further, though the book would have benefited from a timeline. The only place I could find Louise's birth and death dates was in a quote from Louise used on the page before the story starts. You get a sense of the time through the story and the paintings, but I wish more explicit time information had been used in the text. Overall, I think this is an appealing and interesting book to add to your Women's History displays this month! 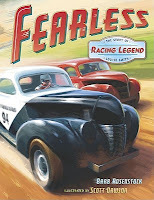 Fearless is on shelves now! And Happy Nonfiction Monday! Catch the roundup at Rasco from RIF!